After a recent spate of jukebox musicals, it’s a thrill to welcome an entirely original British musical to the stage. Gus Gowland’s Pieces of String doesn’t just have a new and warmly evocative score, but also tells a tender, haunting story that’s not based on pre-existing sources. As such, it’s a bold choice for a regional theatre to programme: there are no songs for the audience to come in humming, or a recognisable title to lure them in. But the rewards are plentiful. This is layered and affecting musical tapestry of love, loss, choices and family revelations. Like Everybody’s Talking About Jamie,  it revolves around the relationship between a mother and her gay adult son. But the wariness and distrust that exists between them and her rejection of his boyfriend mean that it could not be more different. As revelations about her recently deceased father’s own wartime past come tumbling out of the closet, the stage is set for the revisiting of painfully missed past opportunities. Gowland’s intricate interweaving of these two stories, one set in the present, the other in the 1940s, is rendered with immense clarity in director Ryan McBryde’s polished, moving production. 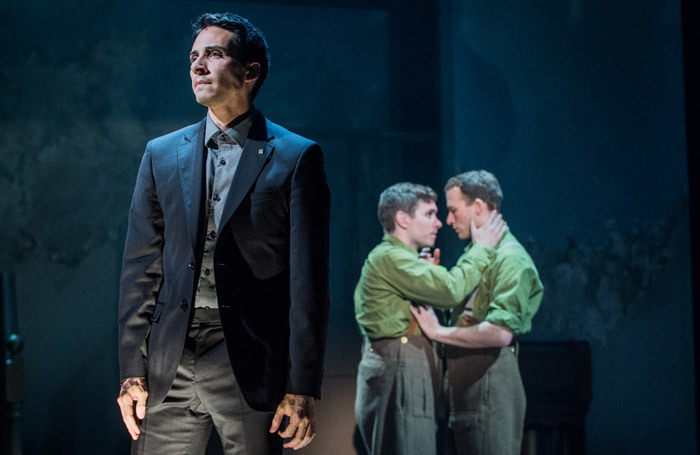 There are deeply textured performances from Craig Mather and Joel Harper-Jackson as wartime soldiers and Andy Coxon and Gary Wood as the contemporary partners. But the show is also unusually strong in showing the women’s role in the story, including Carol Starks as the dead man’s daughter, Marilyn Cutts as his sister and Lauren Hall as his wife. Linbury prize-winning designer Fin Redshaw provides a set that cleverly differentiates between the two time periods through subtle shifts of palette in Ben Cracknell’s lighting. Copyright © 2019 The Stage. All rights reserved.